If you have any photos of you in your TrendyTeeShop shirt, we would love to see them! (And maybe even put on our website!!) Also, we love getting reviews too! Please email us as trendyteeshop@gmail.com! Didn't find what you were looking for on our website? 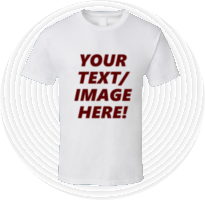 Have your own image or text you want on a shirt? Email us at trendyteeshop@gmail.com with your request! Send a photo, idea, or text, and we will send you a link to your product! There is absolutely no charge and you do not have to buy the shirt! This way you can see what the shirt may look like before you buy!